Did you know that crayons are available in everything from kids’ quality to those used by artists who make their living with their creations? Crayons may be water soluble, oil-based, or wax-based. Learn how to choose crayons and the best uses for each type. They are perfect for adding color to images or for creating original art. Wax and oil-based crayons are perfect for resist techniques, too. Once you know the properties of each type of crayon, you’ll be coloring up a storm in no time! As a kid (the last in a large family) I felt quite special when I moved from the box of 24 crayons to a box of 48 beauties as the school year began. I have to admit that I envied my classmates who owned the big box of 64! Today, you can even buy a super big box of 96 lovelies! It’s amazing that a box of waxy pigments can evoke such strong memories and still provide so much fun in one’s creative space. Crayola, the brainchild of Edwin Binney and C. Harold Smith, is usually the brand that springs to mind when one thinks of crayons. When pigment is combined with a dry binder of some type and shaped into a stick form, the resulting art material is called a crayon - a word that dates back to 1644 when the words “chalk” and “creta” (Latin for earth) were creatively melded together. As early as 1813, crayons are referenced in the classic book Pride and Prejudice by Jane Austen! Who knew?! Some of the first cylinder-shaped crayons that originated in Europe were made with charcoal and oil. As new pigments became more widely available, they replaced charcoal and paved the way for the vast array of colors we know today. Crayons have come a long way! 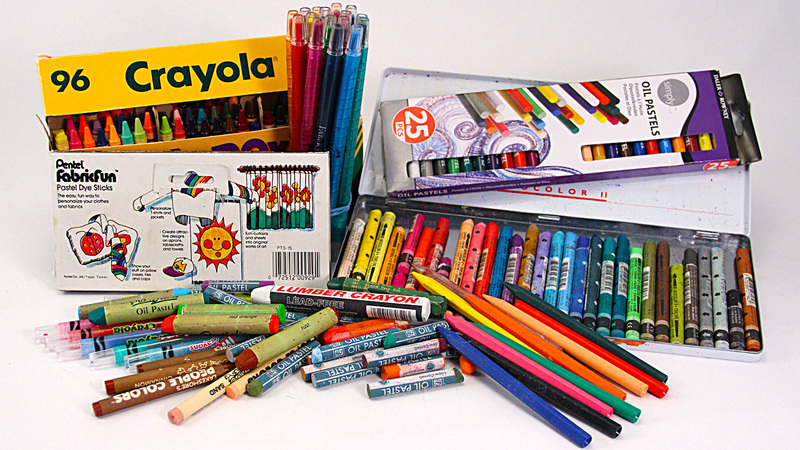 Wax, oil, chalk, grease and watercolors are each available in a crayon. As companies combined various raw materials, the humble crayon grew into highly sophisticated art products like Conté crayons from Paris, a wonderful hybrid of compressed powdered graphite or charcoal and wax or clay. Water soluble crayons are created with pigments bound in water soluble wax or oil which may be activated with a wet brush or simply used as any other dry pigment crayon for drawing or smudging. To make life even more deliciously colorful, some oil-based crayons may also be activated with water while others cannot. Crayon overload! To make your creative life even more interesting, colored pencils are often called pencil crayons! You’ll see several kinds of pencil crayons in the video class. Each type of crayon has unique characteristics and experimenting is the best way to take full advantage. In other words, get out those crayons and stay playing! Download your notes and I’ll see you in class.